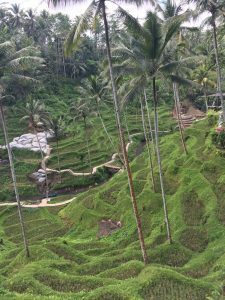 About 1 hour and 15 minutes from South-Denpasar, just above Ubud, lays Tegallalang. 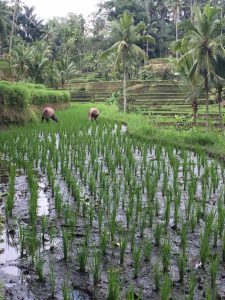 At the south of the central road of Tegallang, there is a coffee plantation with the famous Luwak coffee and when you drive more to the north, you can walk to the rice fields. When I arrived at Alas Harum AgroTourism, I was nicely greeted by a girl who gave me a bracelet of the plantation. With this bracelet, you can visit the beginning of the park, taste the different kind of flavors and see how they process the beans. They will tell you about the special way of growing the Arabica and Robusta beans. The Luwak cats eat and digest the coffee beans. After they wash and soak the beans so that all the bacteria die. After this, the let the beans dry for a couple days. 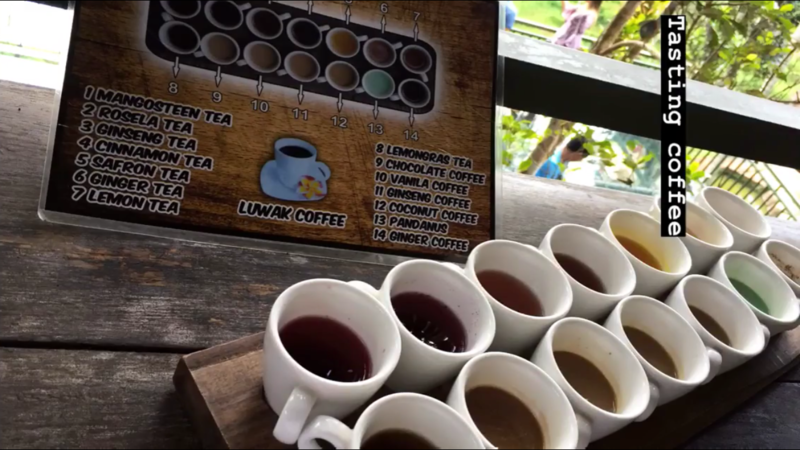 When you walk further, you can order free tasting coffee plate and a Luwak coffee for 50,000 Rupiahs. I don’t know whether this is the real coffee Luwak, but as a young barista, it was worth a try. This fresh coffee has flavors of cherries and I also tasted a little bit of chocolate. This Luwak coffee is for sure better than the Bali coffee. The Bali coffee was too weak, and I think it had no taste. For the 14 coffees, you can taste for free, I can recommend the Ginseng tea and coffee. The taste is not as sweet as the other tea’s and coffees, but it is more floral. 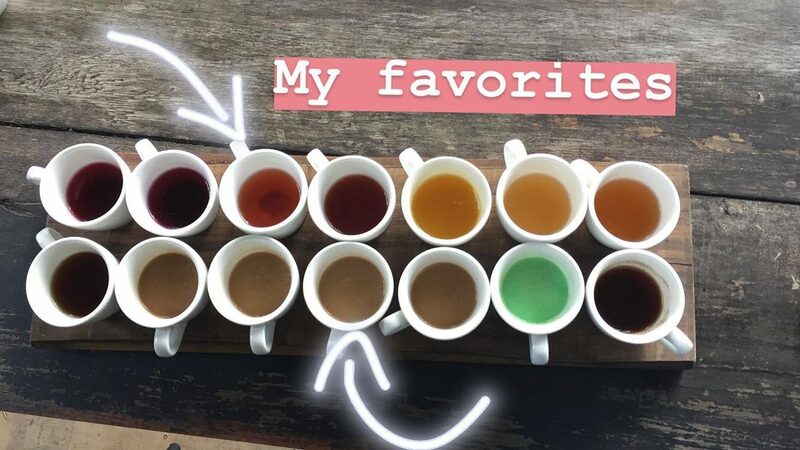 When you are a huge fan of ginger and you like a strong taste of ginger you should definitely try the ginger tea and coffee. At the terrace where you can taste your coffee, you have a nice view over the plantation. There are swings above the fields and the view is beautiful. At one of the terraces, there is a glass floor, which is a bit scary when you are afraid of heights. However, this gives an extra experience at the lovely view. If you would like to see more of the plantation and swing through the fields, unfortunately, you need to pay for this. I decided to go because I also wanted to see the rice fields and could walk through there. So, I took my scooter and drove more to the north on the central road of Tegallalang. On the way, I needed to get some gasoline because my scooter was almost empty. I stopped at a random “gasoline” station, and the people there were so polite. A mother with her baby came running to me and this baby was so cute and smiled all the time. He reached his hands to me, so I could hold him while I was talking with the mother and the man of the gas station. These kind of random moments and polite people are so nice memories. I parked somewhere along the road and could walk downstairs through a shop into the rice fields. I did not pay for the entrance, but I was asked to do a donation for the maintenance of the rice fields. 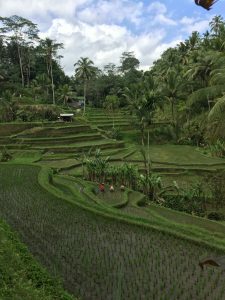 I heard that other people did pay an entrance fee, so it depends where you enter the rice fields. You have to maneuver along all the selfie sticks, but when you go further and take the small paths it will become quieter. Here are also the famous swings where you have to pay for, but more in the back of the fields, there are hammocks where you can lay in for free and watch the view. I think this has the same effect as the swings, but calm and more peaceful than the swings. After, I walked more through the rice fields and went back to my scooter. I bought a nice painting of the field which is hanging in my room now for decoration. Then I headed back to Denpasar. Looks very different to ‘home’ Britt. Great to read about your travels. And could you borrow a selfie stick next time, so we can see you in a picture? Keep on writing!